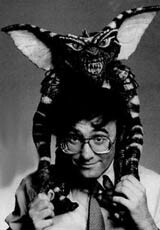 Joe Dante started his film career at Roger Corman's New World Studios as a Promotion specialist editing trailers. He soon became a protege of Cormans editing his first film, The Arena, in 1973 anddirecting his first film in 1976, the highly acclaimed Jaws spoof Piranha. Next came The Howling, still regarded by many as the greatest werewolf film ever made, and Joe was pushed into the limelight. One fan of The Howling is Steven Spielberg who sought out Dante and started the joint ventures which still carry on today. Dante has since then worked with the best of the best in all fields of movie making as well as several television projects but his most famous piece is probably still Gremlins. After a five year break from directing for the cinema Joe was back in 1998 with Small Soldiers. GENERAL AUDIENCES: All ages admitted. PARENTAL GUIDANCE SUGGESTED: Some material may not be suitable for children. PARENTS STRONGLY CAUTIONED: Some material may be inappropriate for children under 13. RESTRICTED: Under 17 requires accompanying parent or adult guardian. NO ONE 17 YEARS OR YOUNGER ADMITTED. NOT RATED: The film has not been rated by the MPAA. TO BE ANNOUNCED: The film is currently in production or planning. TV SERIES or MOVIE: Project made for TV. Individual episode titles (if known) will be given in blue. STUDENT FILM: The film was a project in college/film school and is not available to the public.